There are more than 800 species on exhibit, and each one is worth a closer look. This animal is one of 10 special animals to find when you visit during construction! 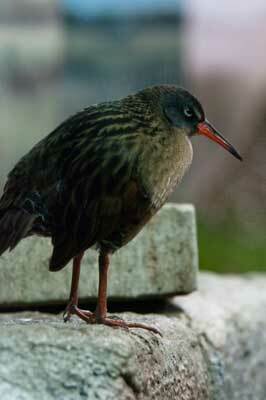 Our Virginia rail is an escape artist! She comes to us from a rehabilitation facility in Wisconsin. Before she was put on the plane and sent to us she escaped from her carrier at an airport security check-point. A chase ensued, they called for backup, and she was eventually corralled back into her carrier. Rails are generally secretive birds who live in marshes amongst the reeds. 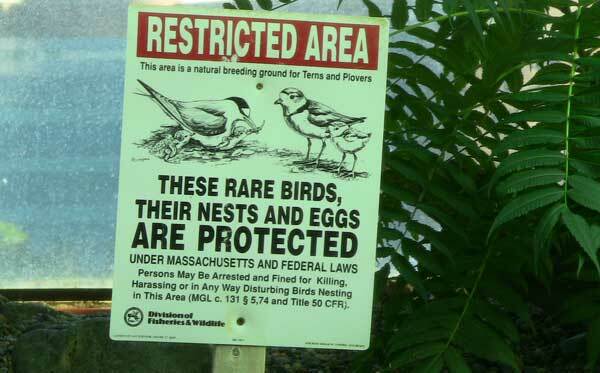 They are found throughout northeastern and western United States and into southern Canada (so, not just Virginia!). In the winter they migrate as far south as central Mexico. They are not picky eaters and will feed on almost any tiny animals found in their marsh habitats: worms, snails, insects, shrimp and even very small fish and frogs. They will also eat the seeds of marsh plants in the winter. They rarely fly, except during migration. They can swim under water, but will only do this to escape predators. Their bodies are especially adapted for moving through the dense vegetation of marshes – they have narrow bodies, long toes for stability while walking on mud and feathers on their foreheads that are tough enough to hold up to pushing through the marsh vegetation. Our bird, however, likes to hang out right in the middle of the pool or along the wall where everyone can see her. Here's a quick video of the rail enjoying some of her favorite spots. Our shorebird exhibit displays not only local bird species but local plants as well. In fact everything you see that's green was collected locally too! Just last week, as the sun has began to rise earlier and earlier, our smooth sumac tree started to leaf out. Next time you visit also look for other local species such as seaside goldenrods, saltmarsh hay and saltmarsh cord grass. Well camouflaged in their winter plumage are, from top to bottom: our piping plover, semipalmated plover, sanderling and dunlin. They're currently molting into their more colorful breeding plumage. Check back for a less camouflaged photo of them this summer! Our piping plover "Pink" hatched on New Seabury Beach in June of 2003. Shortly after he was observed with an injured wing. Once captured he was brought to a rehabilitation center on Cape Cod where two breaks were found in his left wing. It was determined he would never fly again. 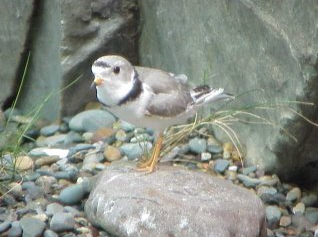 Fortunately he has found a permanent home in our shorebird exhibit along with our other piping plover, May, and five other species of shorebirds. He will be 6 years old this summer! May hatched on June 7, 2001 on the beach at the Coast Guard Training Center in Cape May, New Jersey. We know the exact date because the nest he came from was being monitored by the Coast Guard. By early July of that same summer he was observed with an injured wing, captured and brought to a nearby rehabilitation center. Multiple fractures were found in his left wing and he would never be able to fly again. 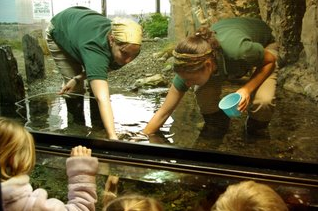 Fortunately, in August of 2001 he found a permanent home here at the New England Aquarium. You can find him in our shorebird exhibit. He will be 8 years old in a few months! 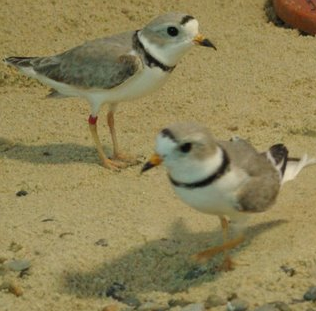 There are two piping plovers in our exhibit, both are males. Piping plovers are a threatened species in Massachusetts, yet our state supports 15 percent of the world's population with approximately 550 of the Atlantic coast's 1,800 nests. Both our birds were injured in the wild and cannot fly. 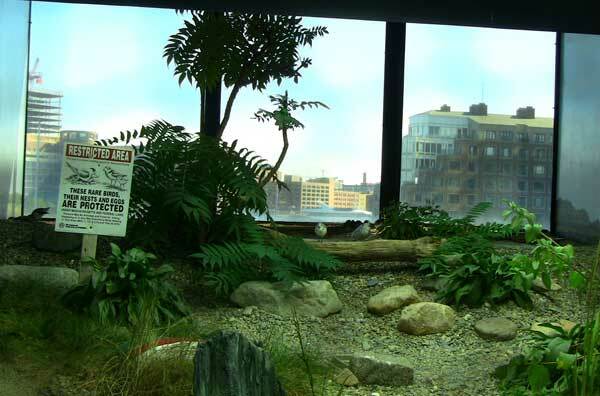 Welcome to the New England Aquarium's shorebird exhibit "In on the Wind: shorebirds and the Boston Harbor Islands". You're about to enter a unique exhibit featuring many different species of fish, plants, invertebrates and birds all living together. Peer through the mesh and you will see, and hear, six species of shorebirds. 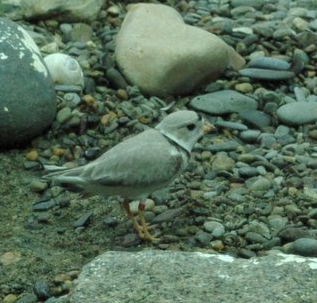 A common tern, two sanderlings, a dunlin, a virginia rail, two semipalmated plovers and two threatened piping plovers can be seen foraging for food amongst the rocks, marsh grass and driftwood and sometimes even in the saltwater pool itself! Press play and watch as our sanderlings catch crickets! Look through the glass into the pool and you will see a large school of mummichogs, silversides and sheepshead minnows darting in and out of the kelp and irish moss. Bright orange finger sponges grow off the sandy bottom where four winter flounder hide with only their eyes peering out. Hermit crabs check out empty periwinkle shells looking for a housing upgrade. If you're lucky you'll see one of the elusive decorator crabs as he makes his way around the tank "decorating" himself by gluing sponges, pebbles and bits of seaweed to his shell. Play the video below and watch as the tataug comes out of the seaweed on the left, takes a bite out of the sponge, and returns to his lair. Please come and visit again and you will have the chance to meet our birds one individual at a time, hear their mating calls, see where they nest and watch as they migrate through the harbor in the thousands! Thank you for visiting!